Over the past several years, New York State has been committed to reforming its juvenile justice system to promote youth success, while ensuring public safety. In July 2011, Safe Communities, Successful Youth: A Shared Vision for the New York State Juvenile Justice System was released, which was a strategic plan developed using the collective impact process. Since that time, the State has made great strides in its reform efforts, backed by the five key conditions that comprise the collective impact process – a common agenda, shared measurement, mutually reinforcing activities, continuous communication, and backbone support. 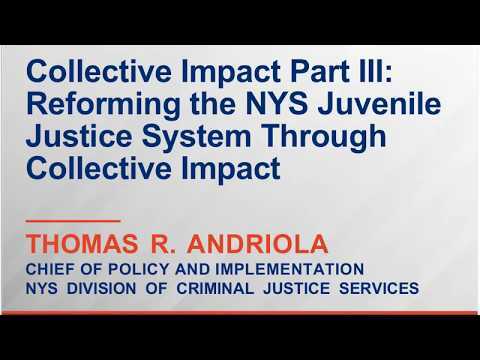 This webinar will take participants through the New York State experience using the collective impact model to reform its juvenile justice system, and will help translate their process into actionable steps as a model that could be used for in any effort.